I should have known better when the conversation during the first date involved stories of her psychiatrist and the medication she was using. Normally, that would be a deal-breaker, but then again, I was already breaking my own rules about deal-breaking with such a date. Rule number one: Don’t date a local girl. Rule number two: Don’t date anyone “younger.” Yet, there I was, walking down the shopping streets of Ximen in Taiwan, with a college girl who went from friendly tour guide to something more– so seamlessly but so quickly that the result was a heady rush usually expected from cheap wine. As a consultant for design engineering, Taiwan had great opportunity– one of the five largest and growing economies in Asia, with decades of dealing with Western counterparts while remaining decades behind in infrastructure. And while my company had many positions available for a whole team of consultants, I had never been placed in a company so deliberately with such a lack of support. While there was more than a simple curb-side drop-off on my arrival to my furnished, temporary apartment, it wasn’t *much* more than that. But no matter. Within a few weeks, I had found for myself a routine for work, a new gym, and familiar faces at my regular coffee shop. In fact, seeing my favorite barista recognizing me and knowing my order made me smile the most. What was it that some famous guy said? Something about somewhere everybody knowing your name? Well, hers was Love. 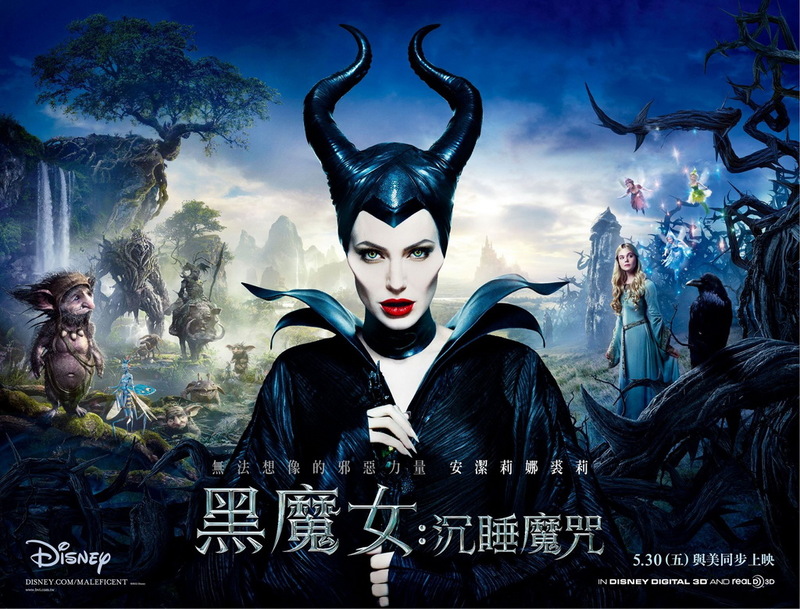 Really, it was PengWen, but her “Western name” was Love. Coffee orders evolved to conversation, then to a connection. “Oh!” she almost yelled with the laugh, “You know Doraemon?” Of course I recognized the blue cartoon cat in the pin on her apron. He’s a robot cat from the future with a doorway to another dimension in his stomach. “Isn’t that just hilarious?” she said, knowing it was so, in that ironic psuedo-hipstery kind of way. Exactly. Why, yes, I would need someone to show me around the city. And why, yes, we did share the same likes and dislikes of food. And movies. And music. And the moon. “Daylight is so harsh. And so bright? What is up with that. The moon is so much more mysterious. You can rest in the moonlight.” The night was filled with more conversation, too, and later, kisses. And later, more. Maybe the mention of the medication at some point days ago didn’t seem so important, not when we also talked of family, her life, her school major, graphic design. There was also her plan to move to the States. And after all, I didn’t want a girlfriend. That was against the rules. She didn’t want a boyfriend, either. That wouldn’t be according to the plan. Good Lord. I was dating someone. A local girl. I didn’t want to do the math to find out she was 12 years younger. It would be just one more reason to not do this. But there was a bigger reason telling me the opposite. I think I was falling in love. Months were passing, and my worry about the relationship went from “should this be happening?” to “when should I tell her?” Our conversations were growing deeper. Her graduation was approaching. There was a threshold coming. 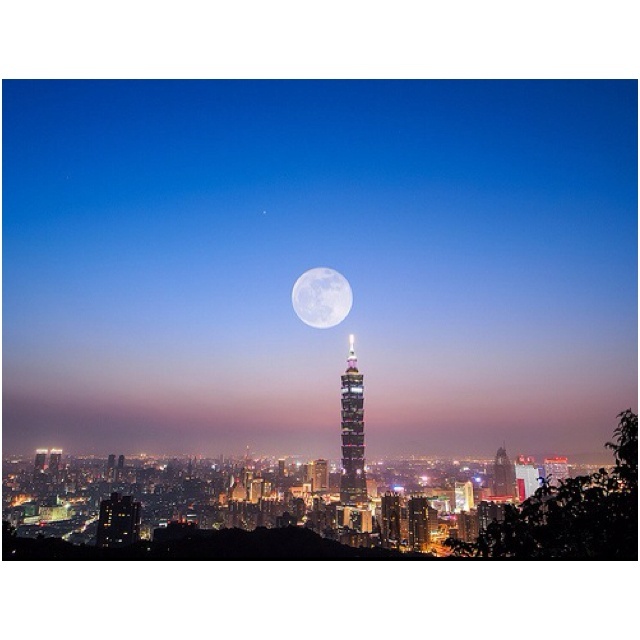 Also coming to Taiwan’s skies was a “supermoon.” I would secretly plan that it would provide an excuse for a nighttime hike, holding hands and kissing under clear skies and giant moonlight. Instead of Skyping, though, I saw a Facebook message from Love. She apologized for becoming my friend, that this friendship was not what she thought it was. She wanted to make it quick; she wrote that she had no “good” friends, was not a good person, and was ending all her relationships. Once upon a time, in the first couple of weeks when first lived alone in my own apartment, I looked at the pile of dishes in the sink and decided I would rather just buy a whole new set, dumping all those in front of me into the trash instead. I tried to parse the message; nuance and playfulness are hard to communicate through a second language, after all. But the words dind’t change no matter how I looked at them. All my replies were being “seen” but not answered. That night, I went to sleep on the bed with the laptop closed on the far side of me and stared at the equally blank ceiling. The next two days, my feet carried me through the city and back home again. My hands did the CAD drawings and emails they were supposed to. My mouth idly ate some food for me. My eyes watched the world as if it were some strange foreign film. Well, if there was one thing I was good at, it was goodbyes. The final word between me and Love would not be the question mark and crooked head sticker sent to elicit a response from social media. I prepared a multiparagraph missive so I could rehearse as best I could my understanding of her feelings, my guess at my own failings, and my attempt to hold her to higher standard, to not give her the easy out. At least we would always have Starbucks. She left the coffeeshop at the end of her shift more promptly then she usually would have. Her head almost buried in a high collar ill-suited for Taiwan’s heat, and her attention buried even more into the private world allowed by her muffler-style headphones, she almost didn’t see me. Or maybe she chose not to. I had to step in front of her to give her whatever it was that I remembered from my rehearsal. After dutifully giving her time to react, she explained, still without really seeing me, that she was drunk that night, but it helped her to say the things that needed to be said. It was a decision she had to do for herself, she said. That it was completely selfish and rude and it confirmed she was not a good woman but it had to be done. For her future. I grabbed her by both shoulders, turning her out of her walk. “No, I can’t accept that. I don’t like the sound of what you’re saying. Are … are you going to hurt yourself?” I searched her eyes, trying to peer into the bottom of the pool. The strangest fact was that there was nothing strange there. They were completely normal, clear pools after all. “I have never made those kinds of plans,” she said. But nothing more came out of either of us. Eventually, “what would you have me do?” she asked simply. She put her headphones back on, faint strains of Adele’s Chasing Pavements wafting by, and continued on her way. That night was the supermoon, the night my heart was broken. Later, we did in fact get in touch with each other again. She was waning herself off her medication and was suffering extreme paranoia, apparently, and talked a bit about that journey. There was a brief, new phase of relationship, but by then, however, even coming back to friends was too arduous a journey, and it would never be what it once was. The next break-up turned out much more mutual, and much more natural. As it turns out, these days, I much prefer the daylight. If you don’t try to blog every day, suddenly you look up and realize it’s been a week or more since you posted anything. I’m still writing for a few projects, it’s just that they are not bloggable, I suppose. That, and I’m packing everything I own into 8 boxes or fewer in order to move countries. There is that, too. I am preparing to leave Taiwan for my next adventure in Shanghai. One of the signature dishes in Taiwan, and one of the first that was shared with me by a local Taiwanese friend, is Sanbeiji, 三杯雞, literally 3-Cup Chicken. It takes its name as the sauce is basically 1 part soy sauce, 1 part saké, and 1 part oil– just braise the chicken and sauce it, topping it all with a ton of fresh basil. That’s basically about it, super quick and easy and thus a favorite for college students who want to not eat at the 7-11 or Family Mart that day. I’ve found it’s best with a few other ingredients to help it along, too. 1. Sear the chicken in a dry pan until you can move the chicken without it sticking. 2. Combine the sauces together then add to the pan, stirring with the chicken. 3. Cover and stew the chicken for about 8 – 10 minutes. 4. Uncover and add the ginger, garlic, basil, and scallions. Crack some black pepper over everything. 5. Continue cooking until the sauces is reduced, another 10 – 12 minutes or more. In the last few minutes, add the tomatoes for brightness and sweetness but don’t overcook them. 6. Serve the chicken and basil over white rice, removing from the stew. 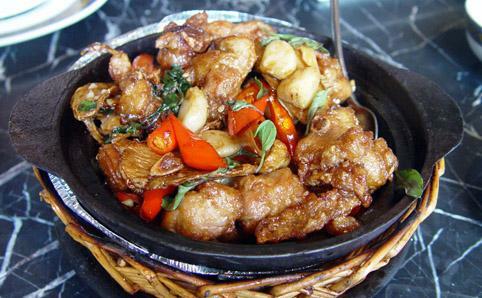 If desired, use a flour rou or continue reducing the sauce to thicken it and top the chicken. My first time I lived overseas. That beguiling charm of mysterious. She let me be with her. Everyone else is jealous. How did *I* get to land her? They’re flaws I can’t begin to ignore. But somehow it’s presumptuous of me to point them out? I tried to make her like me. My ダーリン, it’s you, not me. Closing the door on nothing but walls floor and ceiling. And good-natured neighbors, with lots of flaws. She’ll just let me be me. Or maybe she judges, but with a mutual understanding that any such judgement doesn’t really mean anything. She’d love it if I stayed, but there’s no real chemistry. All those little things are fine but they’re starting to add up. I don’t see this really going anywhere. I guess I needed a rebound country. My 很朋友, it’s me, not you. I want to take so much with me. Shanghai has invited me over. Looks like the start of a new relationship. I’ll finally know what I’m doing? Finally find someone to settle down with? What if THAT is not me, after all? I really, really wanted to make zongzi this weekend. It’s a very traditional holiday food for the Dragon Boat Festival holiday– rice and meat steamed in bamboo leaf wrapping. Talk about comfort food! There’s something about bread and meat wrapped together that’s simply amazing… from tamales and corndogs to dumplings and calzones. Forget sliced bread, these are the best inventions. I will draw the line at stuffed-crust pizza, though. That’s just wrong. 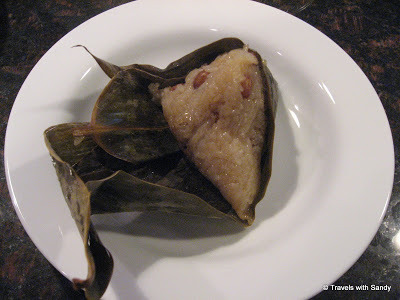 But the problem with zongzi is that there’s just so many steps. My local friend’s mother makes zongzi to sell for a living, and she gets up at 4am and spends at least 4 or 5 hours to make a big batch. Well, I was determined to do it differently. Surely I could single-handedly change what generations upon generations have developed, right? I couldn’t even get through the grocery store. Apparently, it’s more difficult for me to find bamboo leaves in Taiwan than it would be for me to find in Los Angeles. Unless, of course, I’m locally Taiwanese. My friend told me that in general you’d just have to go to various stores here and there to pick up all the ingredients, or go to a local wet market. But this was supposed to be a time-saving version of the recipe! So in the spirit of East-Meets-West I present a completely different infusion inspired by the filling used to make zongzi during the Dragon Boat days. Really, it’s its own meal entirely. 1. Prepare the rice according to the directions. 2. Boil the peanuts for 30 minutes, while you prepare the other ingredients. Drain and set aside. 3. Combine all the spices for the spice rub, and coat the entire surface of the pork shoulder. 4. Use a microwave steamer/dumpling basket to create a pseudo-braised pork. In the bottom of the steamer, combine beer with hot water. Add the rubbed pork fat-side up and half of the diced onions to the basket. Microwave the steamer for 12 minutes. 5. Melt the butter (or heat the oil) in a frying pan and sweat the remaining onions for 3 – 4 minutes. Toss in the garlic for 30 seconds, then add the mushrooms and bamboo shoots. Continue frying on medium heat until the mushrooms have shrunk and the onions show signs of browning. 6. Add the soy sauce and mirin, reducing the heat to low and letting the soy sauce simmer for about 5 – 6 minutes. 7. Shred the braised pork, pulling with forks if possible. 8. Toss the shredded pork and peanuts into the sauce. Add more salt, pepper, and/or five-space to taste. You’re looking for a sweet but aromatic flavor with a hint of spiciness. If the soy sauce reduces too much, add a drop or two of mirin to loosen it, but don’t go overboard. This isn’t a sauce-y meal and you want enough to coat the meat without overpowering the saltiness. 9. Finally, turn off the heat and toss with the green onions and sliced boiled egg. 10. Serve hot over a bed of white rice. 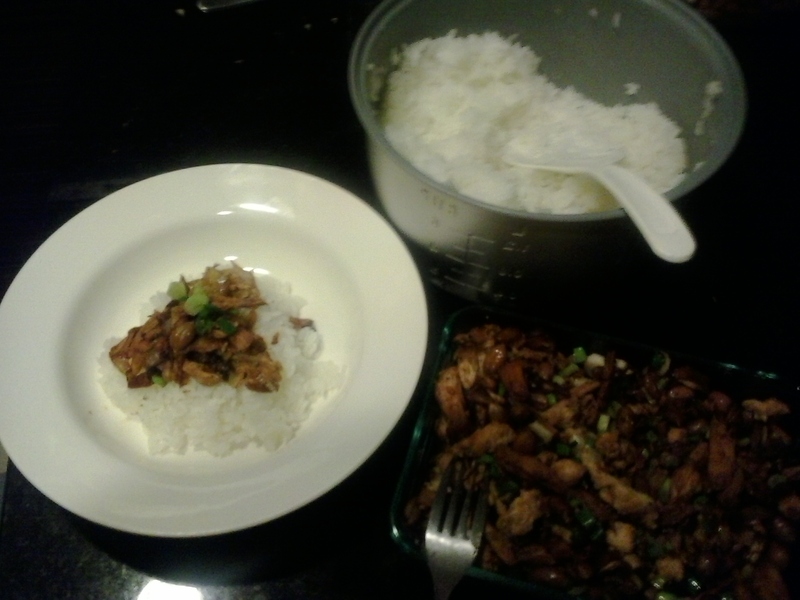 Makes about 5 cups of Dragon Boat Pork & Rice. That’s a few days’ worth for me, but for big families you’ll have to adjust accordingly! You’ll notice that this recipe relies on a steamer/dumpling basket that you can microwave. I’ve fallen in love with the way I can make easily-steamed vegetables and meat in minutes, and often much more health-ily! If you don’t get one for yourself, you’ll have to do an actual-to-goodness braised pork, or perhaps stir-fry some ground pork instead, in step 8. Just use the same spices there as the rub, adjusted for taste, especially the salt! As you can see, this is still a somewhat involved process, but nowhere near the billion-step, multi-hour process of real zongzi. The real stuff uses glutinous rice/sticky rice (needing to be soaked for 3 hours) as well as stews the meat, eggs, and stuffs everything in leaves before finally steaming everything. Phew! This gives you a similar flavor and is better able to be plated, but of course can’t substitute for the real thing. Check out local Asian markets for some prepared zongzi around the end of May, and check out the great variety! This one hopefully will bring you a flavor of Taiwan. Once upon a time, there was a great poet. Qu Yuan’s had a gift to see wonder and passion in all things and to capture such truth in pictures created by words. So great was this gift, that Qu Yuan became highly respected throughout the Chu empire, and the king himself asked him to stay by his side. The king and Qu Yuan would often sit in the garden and listen quietly to the stillness of the water in the great pond. The king would offer a word to capture the moment, and Qu Yuan would consider it briefly, then speak the correct word. It became a great game, and the king and Qu Yuan became great friends. One day, the king was more troubled than usual. He couldn’t even hear the stillness of the pond. “War,” the king finally spoke. Qu Yuan looked at his friend. “Peace,” he corrected him. But the king was worried about the growing conflict warring states. Any moment of war was too long, and it was now long past a mere moment. That day, Qu Yuan spoke about the wonder and passion and truth in the capital city of Ying and of the people of the Chu empire. The king was moved, and declared that Qu Yuan should be his Left Minister. However, other ministers of the court resented Qu Yuan. They couldn’t understand his words that spoke of wonder and passion, or were angry and jealous of his favor with the king, which might really be the same thing. Their power over words were not of truth but slander and malice. They spun many stories of prose for their king, who finally erupted in rage. Qu Yuan was exiled, far to the south. Qu Yuan’s words could not be stopped. He found himself on spiritual journeys, in conversation with spirits and ancestors, and with more and more truth in poem form. The townspeople marveled how a man could be a bulwark against such foes as Apathy, Disinterest, and Acquiescence, but it was clear: the more Qu Yuan put his spirit into his words, the more his body wasted away. Every day, Qu Yuan would go to the Face Reflection Well and peer inside, lost in the now-gaunt image of himself. He saw the truth of himself, too; the grip that his ideals had on him. He could never understand how the great but humble state of Chu could ever yield to the threat of the Qin. And so it was that, when the city of Ying was finally swallowed in the relentless rising tide of Qin, there was only one more poem left inside the thin frame of Qu Yuan. His brush left the paper. Qu Yuan’s eyes took in the mighty Miluo River. His hands struggled to lift the mighty rock. His feet stumbled towards the shore. The townspeople waved a cheery hello until the strangeness of Qu Yuan’s stumblings made them pause. The fisherman’s boy was the first to call to rally the boats, but Qu Yuan had already submerged himself to his waist. 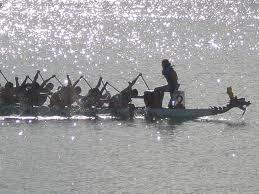 The longboats were truly racing now, the fisherman’s boy leaning nearly prostrate from the prow, slapping the sides to keep the rowers in time. But it was too late. Qu Yuan’s head had gone missing below the surface. Only a few bubbles remained on the surface, trailing toward the middle of the river. The fisherman’s boy reached the end of the bubbles first, and people from the shore cried out a cheer as he grabbed at something in the water. He held high a bit of cloth used to bind Qu Yuan’s headpiece to his hair, but that was all. The cries turned to crying. And soon, the evening turned to dark. Deep into the evening, the fisherman, his boy, and several friends of Qu Yuan sat in various longboats in a vague circle around the very spot. They were tired, but they continued to idly toss in bits of rice into the water. They must keep the fish distracted! What an improper ending for such a dignified man, to be eaten by fish! Day by day, however, and one by one, the longboats and friends had to disappear. The fisherman’s boy threw the last bit of his rice into the water, then sighed. He had to go back, too. The sun kept rising, the wind kept blowing, and the stomach continued demanding to be fed; no matter that it was now a Chu sun and not a Qin sun, nor if it were now Qin winds and Qin stomachs. But the townspeople knew the power of words. They would remember Qu Yuan’s walk into the river as a proud legend of a man sacrificing himself for the unrequited love of a city that died. And every year, on the fifth day of the fifth month, they would race the longboats and eat triangles of rice and hope and search once again for the wonder and passion and truth in the world around them. There are a few things you take as a given in life. Death, taxes, and the fact that no one really eats peanut butter outside of North America. Aside from scarcity, you got other problems of price and brand. It’s not uncommon to find a normal-sized jar ranging from 8 – 12 US dollars, and that’s pretty much universally going to be Skippy brand peanut butter. My favorite brand used to be Trader Joes All-Natural Unsalted peanut butter, but obviously that’s not going to work. You can’t even take those things on airplane carry-ons anymore. I will hold out to the bitter end to avoid anything Skippy, mostly due to the presence of the hydrogenated oils that mute the taste of what should be, you know, tasting like *peanuts. * There’s another reason, too, in that I can’t really look at Skippy and not be reminded of the nearly full century-long trademark battle that occurred because Skippy used to be an American icon and popular comic character, until someone ignored a court order and kept using the mark for their peanut butter. True Story. But here’s the thing– peanuts are readily available and used throughout Asian cooking, as is peanut oil. I can make my own homemade peanut butter for almost a quarter the cost. Better tasting, more healthy, and cheaper. And all I have to do is spend a little time at the blender and deal with the clean-up afterward. Hmm. On second thought…. Ah, just kidding. Step One: Pulse the peanuts in the blender until they are reduced to crumbs. Step Two: Add oil and blend. You’ll need to stop at several intervals to use a spatula to manually stir in the more creamy stuff at the bottom. Step Three: When the peanuts are nearly broken down (when you don’t have to use a spatula anymore, after about 4 minutes), set the blender aside. 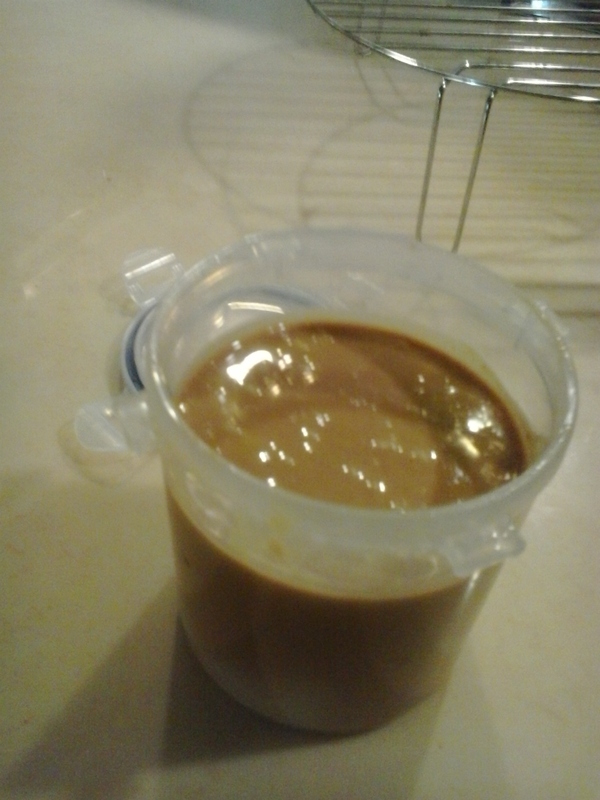 Let it cool about 10 minutes or so, and then continue blending for another two minutes. Add a dash or two of sea salt at this point if you want. Not many recipes call for the vanilla, but it really enhances the flavor when you eat it with fruit or jams. I sometimes add another 1 tbsp honey as well, but I don’t always like having have a sweet peanut butter.